Dear brothers and sisters, good morning and happy party! Today's Word presents us with an alternative. In the first reading there is the man who originally says no to God, and in the Gospel there is Mary who at the annunciation says yes to God. In both Readings it is God who seeks man. But in the first case he goes to Adam, after sin, asks him: "Where are you?" (Gen 3,9), and he replies: "I hid myself" (v. 10). In the second case, however, it goes to Mary, without sin, who answers: "Behold the servant of the Lord" (Lk 1:38). Here I am the opposite of I hid. Here I am open to God, while sin closes, isolates, makes one remain alone with oneself. Here I am is the key word of life. It marks the passage from a horizontal life, centered on oneself and on one's needs, to a vertical life, slender towards God. Here I am to be available to the Lord, it is the cure for selfishness, it is the antidote to an unsatisfied life, something is always missing. Here I am the remedy against the aging of sin, it is the therapy to stay young inside. Here I am to believe that God counts more than my "I". It is to choose to bet on the Lord, docile to his surprises. So to tell him here I am the greatest praise we can offer him. Why not start the day like this with a "Here I am, sir"? It would be nice to say every morning: "Here I am, Lord, today your will be done in me". We will say this in the prayer of the Angelus, but we can repeat it already now, together: Here I am, Lord, today your will be done in me! Mary adds: «It happens for me according to your word». He does not say: "happen according to me", but "according to you". He does not limit God. He does not think: "I dedicate myself a little to Him, I hurry up and then do what I want". No, Mary does not love the Lord when she goes, in fits and starts. He lives trusting God in all respects. Here is the secret of life. It can all those who trust God in everything. But the Lord, dear brothers and sisters, suffers when we answer him as Adam: "I am afraid and I am hidden". God is the Father, the tenderest of fathers, and desires the trust of his children. How many times we suspect him, we suspect God! We think he can send us some proof, deprive us of freedom, abandon ourselves. But this is a great deception, it is the temptation of the origins, the temptation of the devil: insinuate the distrust of God. Mary overcomes this first temptation with her I am. And today we look at the beauty of Our Lady, born and lived without sin, always docile and transparent to God. This does not mean that life was easy for her, no. Being with God does not magically solve problems. The conclusion of today's Gospel recalls this: "The angel turned away from her" (verse 38). He turned away: it is a strong word. The angel leaves the Virgin alone in a difficult situation. She knew how particular she would become Mother of God - the angel had said - but the angel had not explained it to others, only to her. And the problems began immediately: think of the irregular situation according to the law, the torment of St. Joseph, the skipped life plans, what the people would say ... But Mary puts trust in God before the problems. It is left by the angel, but he believes that with her, in her, God has remained. And he trusts. Trust God. It is certain that with the Lord, even if unexpectedly, everything will be fine. Here is the wise attitude: not living depending on the problems - finished one, another will present itself! - but trusting God and entrusting himself every day to Him: here I am! "Here I am" is the word. "Here I am" is prayer. We ask the Immaculate to have the grace to live like this. Today, Bishop Pietro Claverie and eighteen religious and religious comrades, killed in hatred of the faith, are beatified at the Shrine of Notre-Dame de Santa Cruz in Oran, Algeria. 19 new Blessed! These martyrs of our time have been faithful announcers of the Gospel, humble builders of peace and heroic witnesses of Christian charity: a bishop, priests, religious, religious and laity. Their courageous testimony is a source of hope for the Algerian Catholic community and a seed of dialogue for the whole of society. This beatification is for everyone an incentive to build together a world of fraternity and solidarity. Let's applaud the new Blessed, all together. I assure a memory in my prayer for the boys and the mother who died this night in a nightclub in Corinaldo, near Ancora, as well as for the numerous injured. I ask for all the intercession of Our Lady. I greet you with affection, pilgrims from Italy and from different countries, especially families, parish groups and associations. On this feast of the Immaculate Conception, in the Italian parishes the membership of Catholic Action is renewed, an association that has been a gift and a resource for the Church's journey in Italy for 150 years. I encourage his diocesan and parish articulations to commit themselves to the formation of lay people capable of bearing witness to the Gospel, becoming a leaven of a more just and supportive society. I cordially bless the faithful of Rocca di Papa and the torch with which they will light the great star on the fortress of their beautiful town, in honor of Mary Immaculate. 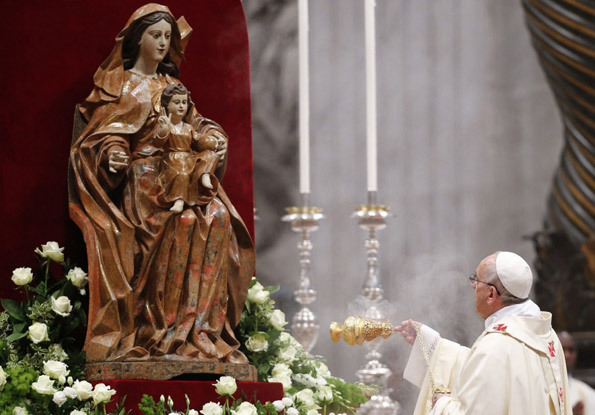 This afternoon I will go to Santa Maria Maggiore to pray to Our Lady, and then I will go to Piazza di Spagna to renew the traditional act of homage and prayer at the foot of the monument to the Immaculate. I ask you to join me spiritually in this gesture, which expresses filial devotion to our heavenly Mother. And I wish everyone a good feast and a good journey of Advent with the guidance of the Virgin Mary. Please do not forget to pray for me. Good lunch and goodbye!